The house is set over one floor and the property is accessed from a quiet tarmac lane by a metal gate. There is a huge and very old orange tree to guard the gate. The house is connected to mains water and electricity. There is a round shaded terrace to the rear of the house, from which there is the entrance door to the open space kitchen / living room with open fireplace. This room has a window to the lane. From this room there is a door to a spacious modern bathroom with shower cubicle, toilet, bidet and pedestal sink. To the other side of this room there is a door to the good sized bedroom, which offers space to have a custom built wardrobe installed. From the bedroom there is a door to another, somewhat smaller room, which has a built-in wardrobe with hanger and drawers. The garden is completely flat and has lawn laid, and it boasts a good number of very well maintained mature fruit trees, like fig, apple, nespereira, two cherry trees and various citrus fruit trees including lemons. The house lends itself perfectly for a holiday home, requiring very little maintenance works. The garden is private and offers a great space to spend some relaxing days or weeks, with a number of refreshing river beaches in the area luring to discover the surrounding original Portuguese landscape. 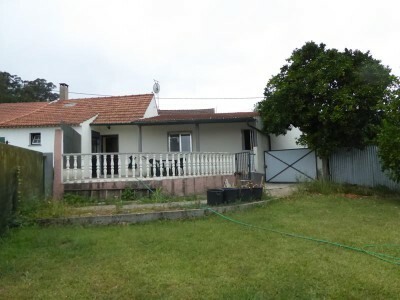 The house is located only 1.5 km from the nearest hamlet, named Maçãs de Dona Maria, where we have essential amenities like health center, mini-market, cafés, restaurant, the local major´s office, and there is a popular summer festival held every August. Both the larger villages of Cabaços and Alvaiázere are 10 km away. The historic town of Tomar, which is home to the UNESCO listed Convento do Cristo, founded by the Templars is 40 km, a 35 minute drive away. Both the airports at Lisbon and Porto are just under a two hour drive away.